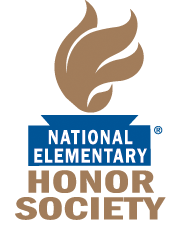 What is the National Elementary Honor Society (NEHS)? Our school operates an official chapter of the National Elementary Honor Society (NEHS). NEHS is designed to recognize students in grades 4-5 that have achieved academic excellence and demonstrated responsibility within and outside the classroom. Its purpose is to develop leadership and service activities through meaningful service projects that benefit the school and community. What Are Benefits of Joining? Membership in NEHS is a nationally recognized honor and helps prepare students for competitive programs in secondary and postsecondary education. Students also learn important leadership skills and learn the value of community service. Finally, members receive special emblems, certificates and honor cords to be worn during graduation. Students must meet the following criteria to apply. See our official bylaws at the end of this page for more details. Candidates eligible for election to the chapter shall have a minimum grade average of a 3 for the current trimester and the previous two trimesters the student has been enrolled in the school. Students must demonstrate exemplary behavior as determined by school policy standards. Students may not have any major or severe disciplinary referrals for the current school year. Students may not have three (3) or more unexcused absences and six (6) late arrivals past 8:25 AM from August until the first nomination period in November. The school has its first member nominations in November of each school year. Students that transfer to the school or were ineligible at this time are able to apply in February at the end of the second trimester. Students that meet eligibility requirements will receive a member eligibility form to be completed by the student and parents. After receiving this form, the school's faculty council will vote to determine official members. These members will be recognized at a special ceremony.